Style #T3435 - If you're looking for comfy, full coverage sleepwear that helps to fight against annoying night sweats, our Women's Long Sleeve Pajama Set from Cool-jams™ is the perfect choice. This cute and comfy set comes with a V-neck long sleeve top and a pair of drawstring pants to complete the look. Unlike your typical pajamas, this pajama set is made of our unique Cool-jams™ fabric that is designed to wick away moisture, eliminate odor-causing bacteria and leave your skin feeling cool, dry and completely fresh, even after a full night's sleep. 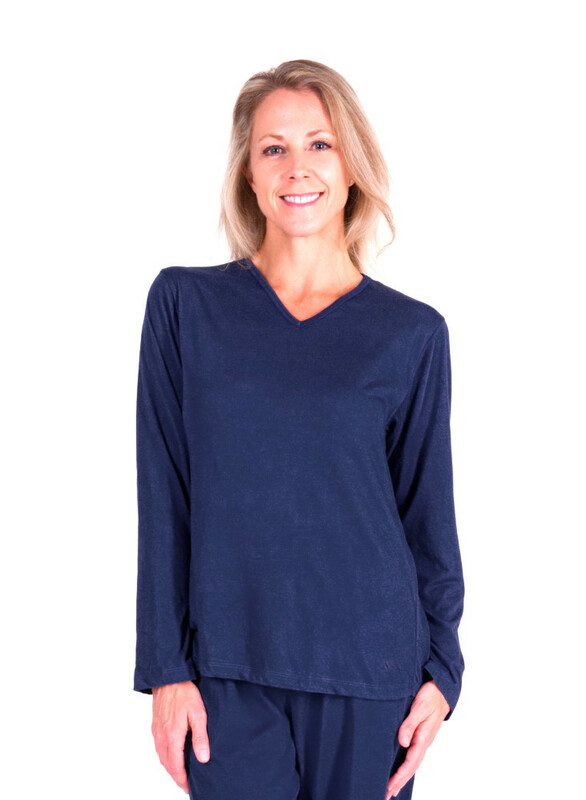 Not only is this Long Sleeve PJ set great for combating night sweats, the lightweight feel and wrinkle-resistance also make them perfect for travel. With Cool-jams™ technology that never washes out and a comfortable fit that comes in a selection of sizes, these will quickly become the most versatile and reliable pajamas that you own. Pant inseam length is 30". Note: The colors Violet and Turq-Sea are being closed out, so stock is limited in these colors. Garment weight approximately 12 oz. 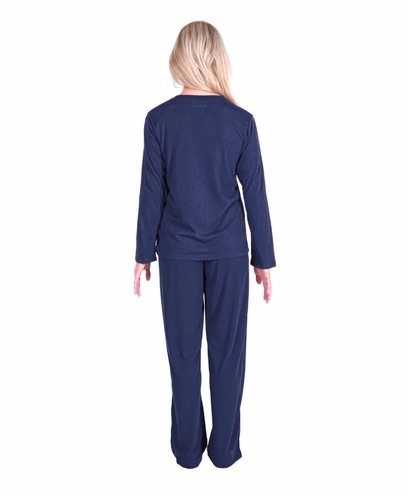 Wash this women's long sleeve pajama set in cool or warm water on gentle cycle. Never use fabric softener or fabric softener sheets because it will minimize the wicking properties of the fabric. If you accidentally use fabric softeners, re-wash the garment in clear water to remove softener residue, so the wicking properties will return to maximum effectiveness. Lay your garment flat or hang to dry. Tumble drying won't damage the garment, but can sometimes create static. I was skeptical that these would be as good as another brand of moisture wicking p.j.s that I had but are no longer being manufactured, but I was desperate & saw that there were really good reviews online so I took a chance. I'm was not 100% sold on the soft material, for though it IS very soft jersey knit like, I thought that it would retain heat. I was shocked when it did not. A slight negative though:it doesn't always allow me to turn as easily as a smoother, silkier fabric would,(and I roll alot to get out of hot spots on the bed!) BUT after wearing them a few times, I was won over. I can not express how amazed I was that I didn't very often over heat . (please note that I am post menopause & sleep in a room that's at most 68 degrees at night) these were pretty pricey for p.j.s (for me) but I really have not seen (or tried) anything better (that's available). If I could change anything about these, it would be a personal preference of having a long neck top that is crew neck (my neck get's cold !) . the waist is a bit "bunchy" fabric wise (I have a 33" inch waist & 42" hips & so bought the Large) and I really, really wish that the leg openings were not so wide. For while me feet get hot, my ankles & calves get cold as these will slide up to my knee because of all my moving around. (I'm going to see what I can do to fix this). Like I said, personal preference ! I was really looking forward to these pjs. I am finding that they absorb sweat pretty well. They might also be well suited as loungewear. Merchant's comment: To make sure they continue to absorb sweat be sure to never use fabric softener. You are correct. Many people love these pjs as loungewear! Very soft and comfortable. No scratchy tags. I love them! They fit great, very comfortable & soft! & they really do stay dry! It makes my nights so much more tolerable. Thank You! I'm definitely buying another pair! This is the third pair I've purchased over the past year, because I love the fabric and feel. However, the fit is not quite consistent. One pair has a shorter waist, almost a hip-hugger fit, while the others fit closer to my waist. Merchant's comment: Thanks for your comments. Just to let you know.... different styles have sightly different specs. Although rise can change slightly from style to style but specs should be the same if you are purchasing the same style. Feel free to contact customer service for any specific measurement questions. All cool jam pjs are fantastic for those with night sweats -- the difference beteeen a good and soso night's sleep. My only gripe is the cuts of the tops and the colors are not all to my taste. I prefer the scoop neck over the v-neck.Thank you! I can sleep soundly knowing I won't wake up in a puddle! They are very comfortable but the pants are too long and the top is a little large. Merchant's comment: Thanks for your comments. We would suggest a smaller size next time since pants would be a bit shorter and top a bit smaller. I love these pajama's! I already had a short sleeve set that I love and just added the long sleeve set for winter wear. They are so soft and comfortable I could wear them all day as loungewear! Very happy with my purchases! 2. Keeps me temperature regulated in all seasons so I sleep great! 6. Lots of great styles and colors! 7. Available for men and women..., so now you have me covered for all those hard to find gifts.